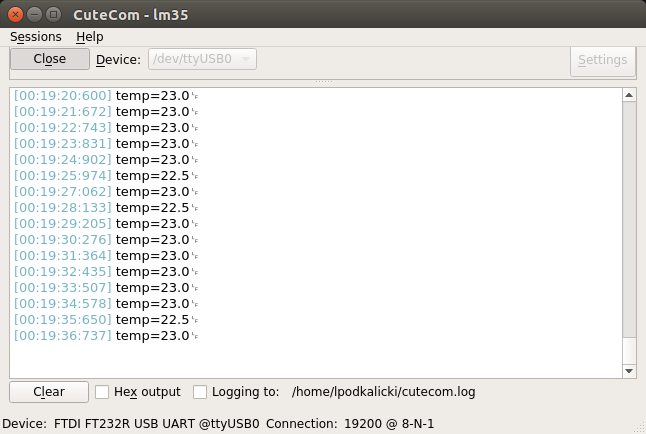 Since ATtiny13 does not have hardware USART/UART in some cases we’re forced to use Software UART. 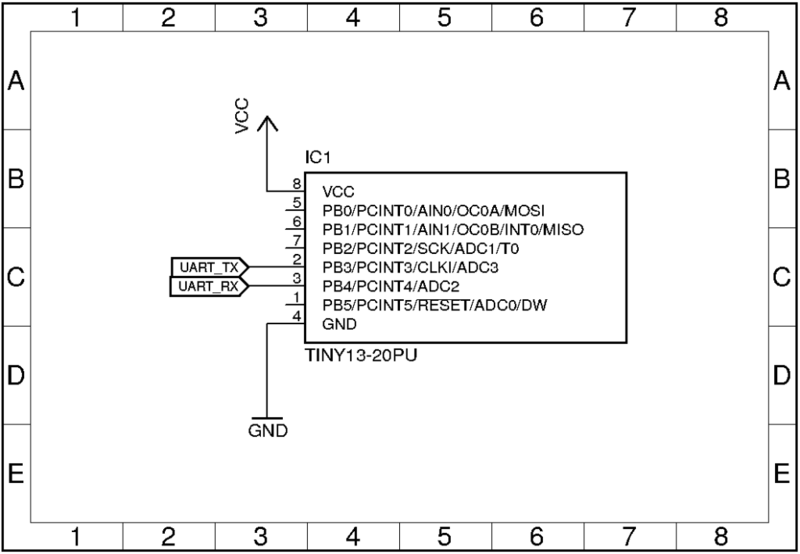 In this example project a simple bit-banging UART has been presented. 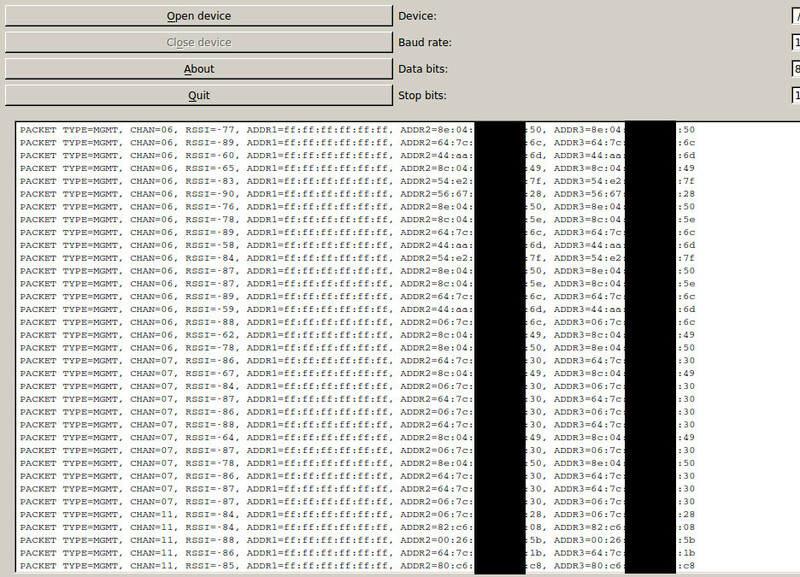 Compiled for both TX and RX it uses just 248 bytes of flash. Default serial configuration is 8/N/1 format at 19200 baud (lowest error rates during tests). 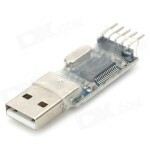 It can be easily changed to other standard RS-232 baudrate. Note that it is a great solution for a simple debug/logging but to other purposes I would recommend using an AVRs with a built-in UART. The code is on Github, click here. 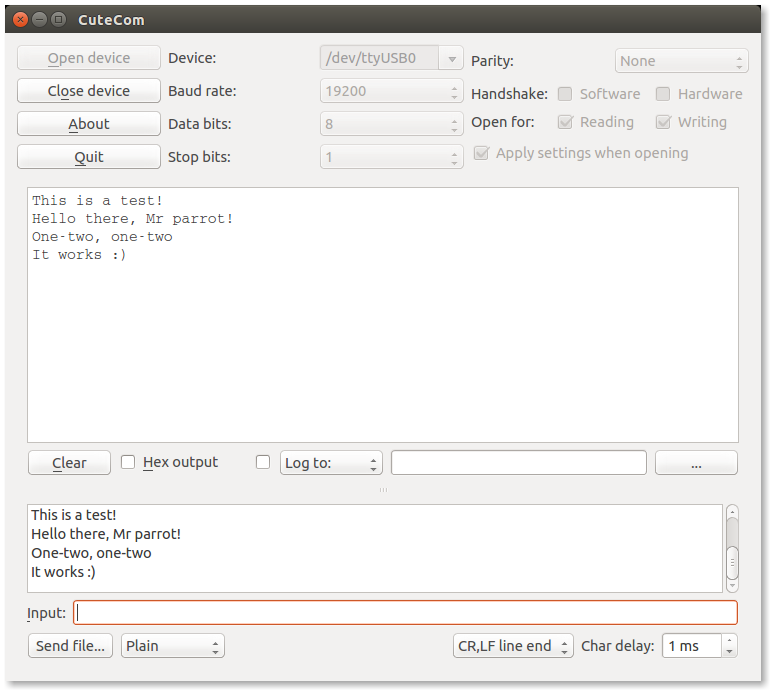 I usually use CuteCom – a graphical serial port communications program, similar to Minicom.
" subi r18, 1 \n\t"
" ldi r18, %[rxdelay] \n\t"
" in r0, %[uart_port] \n\t"
" ldi r28, %[txdelay] \n\t"
" mov r29, r28 \n\t"
" bst %[ch], 0 \n\t"
" bld r0, %[uart_pin] \n\t"
" out %[uart_port], r0 \n\t"
Hi Łukasz , I am so thankful to you for this solution. Simple and works right away. 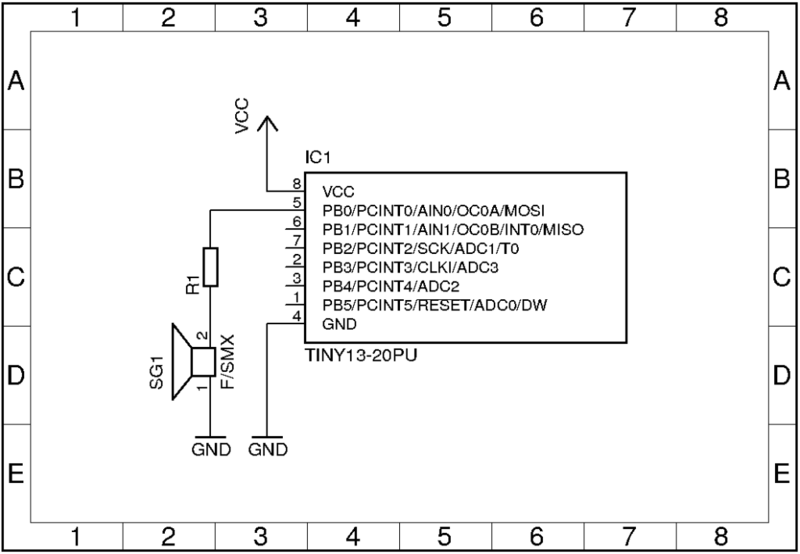 I have been struggling with debugging my ATTiny13 but not anymore. 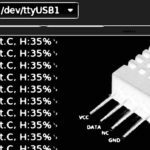 Hi Vijay, I hope to put here a lot more entries about ATtiny13, soon. Thanks! I’m now confused as the code looks identical when comparing these projects. I would be glad if I could get a helping hand …. When I switch to 115200, the example works again. Do you have an explanation for this behaviour? I guess it’s a problem with internal clock which is not so stable. Works right out of the box 🙂 thank you very much Łukasz. 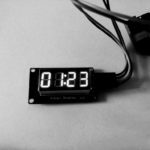 Hi, I like your blog and I share your addiction to such a tiny but powerful devices as attiny13. There no too much resources in internet and your blog is real gem for me. So, first of all – thank you for the great work you did. 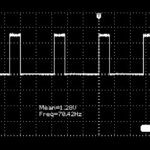 Also, it seems me excessive to do DDRB |= 1 << UART_TX each time when you need to send character (and may be PORTB |= 1 << UART_TX as well). Would it be more efficient to take it out of the function and perform only once in kind of "setup()"? Thanks, Alex. Comments like that give me a power for making next projects. Issue with program hangs was probably caused by incorrect condition inside a loop (Boma-fix). It has been updated on page after you reported concerns about that bug. Yes, you can achieve one-time initialization of I/O pins by refactoring the code. Note that these redundant instructions cost is two clock-cycles while additional setup function will increase the size of program space. This compromise between CPU speed and program space depend on project requirements. You can choose what fits you best. 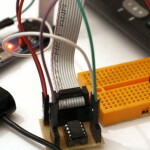 I’ve compiled the code from the repo and uploaded to an attiny13 using an arduino mini. 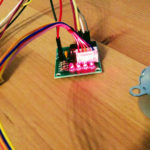 The hex is successfully uploaded without error, but when I connect the uart adapter to the attiny and open the serial monitor there is no response. Why? 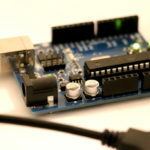 Hi, I must admit that I never tried upload hex files using an Arduino and I cant help with what could go wrong. I always recommend to check twice if there is a bug related to wiring or mistake in firmware code. There’s error in main(). 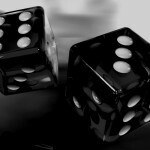 There should be (p – buff) < 16. Fixed. Thank you for reporting that bug. Fixed where? In the page it still with bug. Good eyes! Thanks. Fix has been applied to repo. Now page is updated, too.